I've slowly been whittling the clothing in the closet. It's an ongoing affair. Pull something out, muse on it and decide if it's worth saving. I filled up two grocery bags with shirts over the past month. There were some sweaters amongst those; sweaters I've had for over a decade but which no longer fit and are uninteresting to me. The closet feels lighter, which is a good thing. On one of our recent extremely mild days, I reached in and pulled out a polo shirt. I was a band mom for four years when Carole was in high school. We didn't have anything like that when I was band. We marched in parades and did half-time shows for football games. We played pep band for basketball games. There were concerts in the winter and spring and music contests because we know exposure to music makes kids smarter. But, beyond my mom helping when the music contest was at our school, she didn't travel with the band. This competitive marching that Carole did didn't exist. 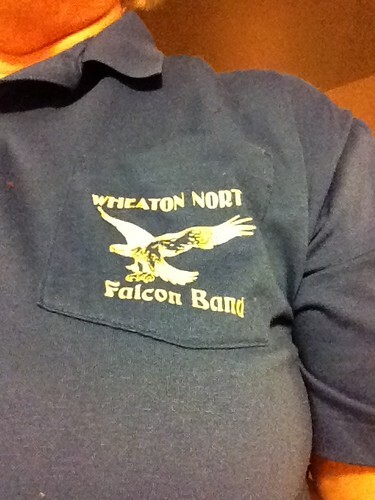 The shirt has remained remarkably well for as old as it is. I was given this by a band parent who was leaving the program. I maybe should have passed it on, but I feel a kind of honor in still having it. As much as it doesn't have real meaning to my life right now, I'm not likely to get rid of it either. It still fits. It wears like cast iron and it represents a time of fun and excitement. Who wouldn't want to save something with memories like that? How Do You Like Your Car?